Situated on the southern island of Shikoku, Ehime Prefecture is a pocket of Japan that’s overflowing with historical and cultural delights just waiting to be uncovered. Oh, and a whole lot of delicious mikan (tangerines)! Though it’s only around an hour by plane from Japan’s capital, the city of Matsuyama and the wider area feels like a world away from the madness of the metropolis that is Tokyo. Home to one of the oldest and most famous onsen in the country and a number of the main sites on the famous 88 Temple Pilgrimage, if you’re looking for a relaxing and unique Japanese getaway you have to add Ehime to your 2018 Japanese travel itinerary. Though it’s a relatively humble prefecture in terms of population, what Ehime lacks in size it definitely makes up for in rich and fascinating history. Trekking all the way around the island of Shikoku, the 88 Temple Pilgrimage, also known as the Shikoku Pilgrimage, is the country’s most famous pilgrimage route. The pilgrims, known to the locals as o-henro-san, are easily identifiable in their white clothing and sedge hats. Following the 88 temples associated with the Buddhist monk Kukai (Kobo Daishi), this journey is no walk in the park. In fact, the entire trek is around 1,200 kilometers (746 miles) on foot and takes walkers an average of 30 to 60 days to complete. However, you can map out your own route as there’s no real method or correct direction to follow, allowing you the freedom to soak up the beauty of the area any way you please. Still standing tall and proud, Matsuyama Castle is one of Japan’s 12 "original" castles, meaning it has survived the post-feudal era intact. Originally constructed during the early 1600s, the current incarnation was reconstructed in 1820 after it was destroyed by lightning. 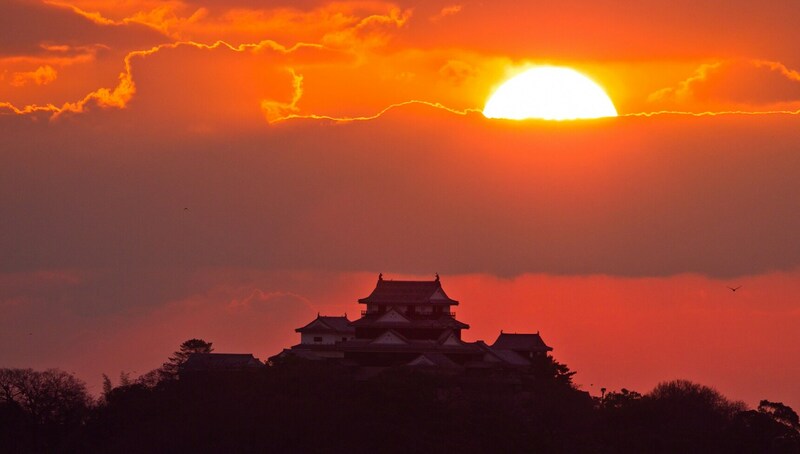 Sitting high atop the city of Matsuyama, this castle is very open to guests, allowing visitors to really get up close and explore what exactly makes a feudal castle so impressive. Featuring a number of wings to wander through and a lookout at the top, there’s really no better way to immerse yourself in the culture of the city than by spending a few hours exploring this amazing building. Though the grounds of Matsuyama Castle are stunning all year round, it’s during cherry blossom season that the area is at its most beautiful. Featuring hundreds of cherry trees dotted along the grounds, the castle’s surrounding area is filled with revelers during the warmer spring weekends looking to soak up the beautiful view of the city while floating high above in clouds of pillowy pink blossoms. Be warned though if you do go to a hanami (cherry tree viewing party), don’t drink too much as the chairlift down doesn’t feature any security bars. If you get wobbly, you could fall off! Shrouded in history, Garyusanso House feels like an area of Ehime where time stood still. Looking over the river east of Ehime’s hidden old town Ozu, visiting this rustic villa is a lesson in the perfect art of Japanese architecture. Originally built in 1907 after 10 years of work, the design took inspiration from Kyoto’s famous imperial villas Katsura Rikyu and Shugakuin Rikyu. Each room is filled with intricately crafted and meticulously planned elements of hidden design. Open to the public most days, a trip here and to the Ozu area is truly a trip back in time. Dogo Onsen is the building that inspired Hayao Miyazaki’s 2001 masterpiece Spirited Away, so you know it’s going to be nothing short of magical. One of the country’s oldest and most famous hot springs, this classic bath is so respected that it’s even been frequented by Japan's most honorable guests, the Imperial Family, who have a secret passageway for entry. Popular with tourists throughout Japan, it’s a fascinating place to people watch. As the sun starts to set and the air is filled with the clomping of yukata-clad guests walking around in geta (Japanese clogs) you’ll feel like you’ve stepped into a movie scene.